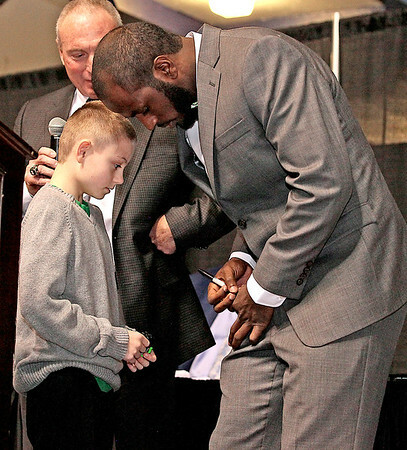 Marshall University quarterback Rakeem Cato signs an autograph for 9-year-old fan Braylon Arvon during the question and answer portion of the Big Atlantic Classic banquet Sunday afternoon at the Beckley-Raleigh County Convention Center. Though coach Doc Holliday and Cato were scheduled for an autograph session at the end of the banquet, Arvon decided not to wait, asking Cato if he'd sign a wristband he got from him during the Herd's Military Bowl win in Maryland. Without a second thought Cato agreed, and Arvon made his way onto the stage and got his wristband signed.